With the internet exploding with information, one trend that is going strong is DIY (do-it-yourself). Think about what you see everyday online: DIY furniture, DIY wedding decor, DIY holiday themed desserts. No need for a professional anymore when there’s a YouTube video to show you how to do it, right? AV production is no exception to this DIY trend. But should it be? With DIY options for any type of event, it can help your timeline, your budget, your stress level, and your overall mood of your event. But have you considered how many people it will take to install your oversized projection screen?Are you willing to pull an all-nighter coming up with content for your DIY video? Did you think about if your venue’s built-in projector to find to match the video equipment you brought from home? It’s important to decide which aspects of your event production that you are willing to DIY and what makes more sense to hire an event professional for. “Don’t sacrifice the integrity of your event by skimping on AV,” shares Wired Production Group Vice President of Business Development, Doug Netolicky, offering up advice to anyone considering the DIY route for AV production. He went on to explain that you don’t want to spoil the ambience of a large event by shirking the costs of professionally mixed audio, lighting, and video components. A poorly executed event production is one of the fastest ways to reduce the value of the time you’ve spent planning, not to mention the lackluster feeling your guests will leave with. It can take years to grow a successful event, but it can take only seconds to destroy your event’s reputation. Professional event production companies will help you develop a set up that works for your guests, your presentation set up, your seating, and your equipment necessary to run the event smoothly. This can create a lot of stress during your event planning process, if you take time to do all this planning alone. – TIME: The time spent trying to learn how to generate AV content from scratch could be used instead to negotiate with event venues in order to score the perfect location for your party. Time is money, and your time allocation is important to create the best event for your guests. – MONEY: By extraneously purchasing or renting all of the AV equipment you would need to create the effect you want at your event, you could very well end up spending more than you would have spent on a custom AV package from an event production company. It’s important to shop around for what would be most cost efficient: renting the AV equipment to do it yourself, or hire an event professional to bring in everything you need and run the equipment for you. – HEADACHE: Have you ever bit off more than you could chew and only ended up frustrated? While most of us have created an iMovie at some point, it’s very different than projecting live audio and video on LED screens at a concert. You’ll save yourself the frustration and exasperation as to why you can’t hear the lead singer over the blare of the background guitarist. – SCALE: If you were looking to project a slideshow at a birthday party, it would be a different story than syncing up 9 different microphones while simultaneously running lights and projectors at a corporate conference for 300. Keep in mind the scale of your production and understand that in most cases, you’ll be better off hiring a production company to help you pull off your vision. – EQUIPMENT EXPERTISE: For as easy as expert audio engineers and video production specialists make their jobs seem, they’ve spent years perfecting their trade in order to seamlessly bring AV production to life. Event professionals take their jobs very seriously as your events become their events. They want and expect the best from all people involved in the event production. When it doubt, it’s better to connect with reputable AV production to a company that specializes in it. There are event professionals for a reason. 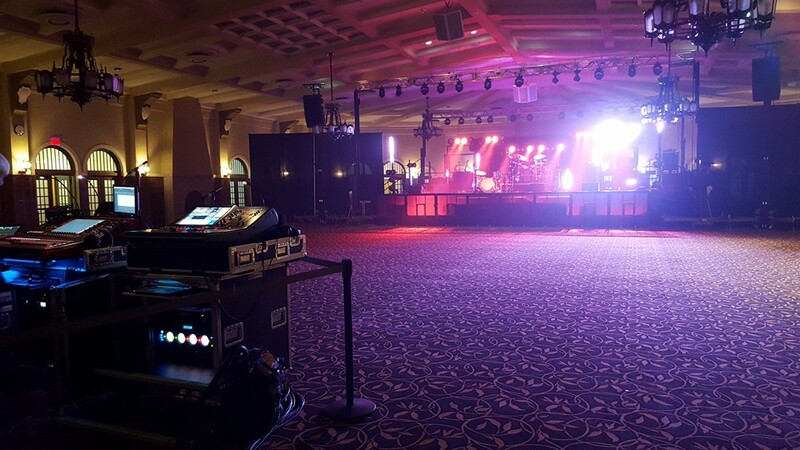 Weigh all of your event production options before jumping aboard the DIY train. Your guests may thank you later.